Ok, I must confess that I am definitely not a fan of animals being dressed in any types of costumes for any kind of occasion. Having said that, I should probably also confess (before anyone of you, sharp readers, points out a picture or two of our dogs wearing a hat or a bandanna) that sometimes I do get crazy ideas and put a hat, bandanna or a scarf on one of our dog´s head to take a pic. I honestly don´t know what I do that. Humans are strange. But regardless of our different tastes, crazy ideas and celebrative mood, safety of our animals is what we all should be considering first and foremost. And because it is a Halloween time, I would like to share a few tips for keeping your animals safe while you are celebrating, or before you decide to put a costume on your dog or cat. This could cause frustration and an enormous stress for them. Their trust in your will decrease. Realize that animals do not understand this type of our fun. Another words, check for any sharp parts that could puncture and seriously hurt the animal, tightly fitting costumes can cause discomfort and pain, the costume should be made of safe materials, not containing dangerous chemicals, and parts that could be easily chewed off, as your pet could choke on them or they could cause blockage in their digestive tract. Watch for parts that could strangle your pet. If you decide to dress your dog or cat in a costume, supervise them all the time! This counts not only for animals wearing costumes, but for all animals in your household, during Halloween. Trick or treaters frequently ringing on your door bell, strangely dressed persons entering your house, scary looking objects (decorations), noise, etc. can be very frightening and stressful for the animals. I highly recommend the use of Bach Flower Rescue Remedy to keep your pets calm on the Halloween night. I have written about their use in more detail in this post (scroll down to the second part of the article). This is generally something I do not believe anyone should do any time of the year, but in this context I mean even letting them outside in the garden or yard. They may get scared by the trick-or-treaters but also could become a subject of a prank. There is also a potential threat, that pets can get stolen, as many strangers walk through the neighborhood. It is a known fact that many black cats have fallen victim to ugly Halloween pranks. Here is another good reason why it is useful to have your animals chipped or ID marked. In case your animals escape or get lost, it can be much easier to find them if they have some sort of identification. A collar with ID tag, or tattoo/chip in case someone brings them to a vet, shelter or police station. Make sure that your dog or cat cannot get hold of any sweets or other treats, including their wrapping papers and plastic. Sweets can be very dangerous to them, and the wrappings can cause them to choke or get blocked in their bowls. 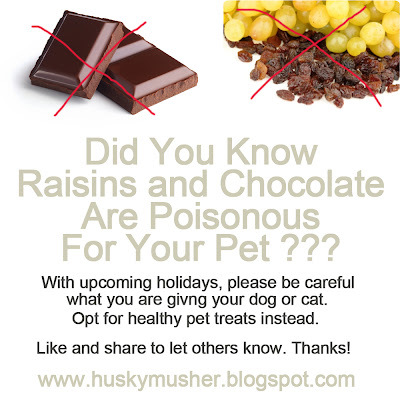 Some human foods are poisonous for dogs and cats - specifically chocolate and raisins (or fresh grapes), and also xylitol, which are a common part of many sweets and treats. If you would like to have some treats for your pets on Halloween, why not try make for example these wonderful, super tasty and healthy Pumpkin Dog Treats? Be extra cautious especially if your dog or cat is wearing a costume, which could infuse in seconds as the animal is passing by a burning candle or even by a pumpkin lantern. Don´t forget animals could easily flip them over by accident and for example if your cat is spooked out from the trick or treaters that just entered your house, she or he may jump up on a table where you have your candles and decorations placed. 8. Watch out of glowing sticks and glow in the dark objects! These can be extremely dangerous for the animals, if they chew on them. Not only could they choke on the small pieces that they could chew off, but these glowing objects are filled with a toxic substance called phenol, which could burn their skin and internal parts. Not only could they harm themselves on the pieces of plastic or glass, but when chewing on these, there is a potential risk of getting life threatening electrical shock. Your dog or cat may be too stressed for you to notice and they may be looking for ways to get out of the house, where they could run away, get lost, hit by a car or stolen. See point 3 and 4. Stressed animals can react unusually, including biting the trick or treaters, so unless your pets are used to a lot of noise and lots of visitors in your house, it may be better for everyone if they can have a quiet, safe place to be, away from the "action". It may be better to have a nice spot ready for your dog or cat during your Haloween party. A place in the house where they feel safe, that is familiar to them, with their favorite bed, access to fresh water and for the cat also the litter box. In cases you know your pets are prone to get stressed during Haloween, you may also consider putting them in a nice day care that they are used to. Happy and safe Halloween to you all! houlton institute teaches very important skills that will benefit every dog lover; both first-time dog owners as well as experienced dog owners. It is an online dog care course and you will be happy after learning it.